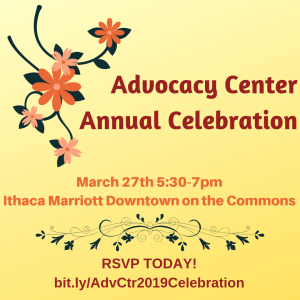 Join the Advocacy Center for our 2019 Annual Celebration on Wednesday, March 27th from 5:30-7:00 pm. We will reflect on the important work completed over the past year and celebrate and honor the strength of survivors in our community. Attendees will learn more about the current work of the agency and meet our staff and board of directors. A delicious spread of hors d’oeuvres will be provided along with a cash bar. All members of our community are encouraged to attend and, while not required, a $15 donation is greatly appreciated. Kassy is a long-standing volunteer for the agency and has made tremendous contributions in various roles. Kassy has been a Hotline Volunteer, an Enough Abuse Community Trainer, a community outreach volunteer, a Kids Are Our Business Table Captain, and has assisted with other events including Take Back the Night. In all of these roles, Kassy has gone above and beyond the standard duties and is often partnered with new volunteers because of her ability to mentor and provide a steady comfort. Read more about Kassy here. Ashley started with the agency as a Hotline Volunteer and, after completing her commitment, moved on to open The Watershed. She is being honored with this award because of her forward-thinking and vision for having a bar that held its patrons to a higher standard by creating a space that recognized and actively addressed sexual violence. This led to the development and implementation of the Barstander Program. Ashley worked with Lead Educator Naomi Barry on the development of this program and The Watershed was the first establishment to participate in the training. Read more about the Barstander program here. Each year we select a local business or donor to recognize how their contributions have helped support the work of our agency. This year, Tompkins Trust Company was selected for their long-time financial support of agency needs including as a long-standing sponsor of Kids Are Our Business, regular donations for often unfunded needs and as a significant donor to our building campaign, allowing us to make this important purchase. In addition to their financial contributions, the overall philosophy of community involvement Tompkins Trust promotes has led to employee volunteerism through our Enough Abuse Tompkins programming, participation in awareness month activities, and membership on our Board of Directors. Can’t attend but still want to support our work? The Advocacy Center relies on the generosity of our community to best serve survivors. To make a donation or learn more about ways to get involved please visit ‘Get Active’ on our website. We greatly appreciate your generosity and support.